Kubo (voiced by Art Parkinson) tells stories. The street urchin loves to regale those in his small township with epic tales of battles fought and won, of selfless heroes defying overwhelming odds, of monsters gigantic eager to swallow up the whole world if left to their own devices. With an unearthly ability to showcase the unthinkable through origami, utilizing his three-string shamisen as if it were a magic wand and not a musical instrument, the kid is amazing, young and old alike thrilling to his adventurous yarns whenever he decides to tell them. What Kubo doesn’t know is that, these stories, these adventures, they came from a place of breathless truth, his sickly mother not wanting to reveal terrible secrets to her son until he is able to protect himself from the evils hidden within the night sky. But when a pair of doll-like witches come searching for the boy’s remaining eye, keeping secrets is suddenly no longer an option. Armed with as much of the truth as he can learn before being forced to flee, Kubo finds himself on the most amazing of adventures. Now, searching for fabled pieces of armor and a magic sword, the youngster might be the last line of defense against an unstoppable demon, his only companions a fiercely protective Monkey (Charlize Theron) and memory-deficient Beetle samurai (Matthew McConaughey) both sworn to assist him no matter what. 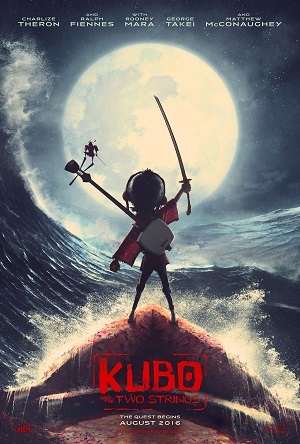 After wowing viewers with stop-motion animated wonders Coraline, ParaNorman and The Boxtrolls, animation studio Laika returns with what is quite possibly their greatest achievement yet, the visually spellbinding and emotionally complex tale of adventure and human togetherness Kubo and the Two Strings. Born from a story by Shannon Tindle and Marc Haimes, working from a script written by the latter and Chris Butler (ParaNorman), director Travis Knight and his crackerjack team of animators have done something astonishing here. Not only is this an original tale, it is one that is both culturally sensitive to its Japanese origins as well as universally accessible to viewers the world over. It is a movie that works beginning to end, practically every piece one worthy of cherishing as events work their way towards their heroic conclusion. The beauty of the film is just how nicely all the pieces fit one into the other. While climactic revelations are hardly surprising, they still come at just the right time, allowing for ultimate emotional impact once they are revealed. More than that, though, the filmmakers do not play fast and loose with things, making sure they stay true to the ideas they have presented while also making sure the characters themselves are never given a short shrift. While victory is never easy or does not come without sacrifice, the actual outcomes are nowhere near as final as they might initially appear, concepts involving community and family key to Kubo overcoming the odds and trying to save the day. There are so many layers, Knight finding a way to navigate through them with dexterous ease, doing so without ever losing focus on what’s most important and why it is so. He and his team also orchestrate a number of spectacular set pieces, one involving a gigantic, Ray Harryhausen-inspired skeleton with swords sticking out of its head so amazing I found myself inching more and more forward in my theatre seat as the scene played itself out. There’s also a number of other imaginative sequences, however, all of them building in power and majesty, and by the time Kubo finally stands face-to-face against the evil that has been shadowing his every step the anticipation that something spectacular is about to take place is practically all-encompassing. If it isn’t entirely perfect, it isn’t for lack of trying. Same time, I wish some of the periphery characters, many of them voiced by the likes of George Takei, Cary-Hiroyuki Tagawa and the great Brenda Vaccaro, would have been given more substantive to do, their presence only made notable thanks to the acclaimed actors giving them life. 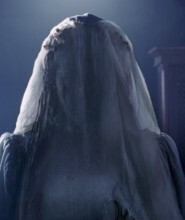 As for the villains, Rooney Mara and Ralph Fiennes do what they can but admittedly they don’t have a lot to work with, the idea and anticipation of their appearances moderately more frightening than when they actually come to pass. But the ending, the solution that Kubo comes up with to see balance restored, is marvelous, while the final scenes themselves have a haunting lyricism that touched my heart while also bringing honestly warranted tears to my eyes. As already stated, it’s also marvelously animated, rivaling all other animated films released so far this year, including Pixar’s Finding Dory, marking it as visual marvel that’s stunning in its colorfully realized magnificence. All of which makes Kubo and the Two Strings an absolute triumph, guaranteeing it a place in my heart I hope it manages to rest inside for the remainder of 2016 and far into the foreseeable future.